The first item we bought for our baby girl's owl nursery decor was Scarlett's baby bedding set. It's called Brooke and came from Pottery Barn Kids. The fabric is very colorful with colors ranging from pink and green to a pretty shade of aqua. The touches of bright green in the owl baby bedding were what inspired us to paint the baby's crib green. The baby bed that we painted is a Jenny Lind style that was initially white. We primed it and then painted it green. We chose to spray prime it because of the spindles. We used Kilz brand spray primer that we bought at Home Depot and then spray painted it using Valspar's Garden Green from Lowe's. Spray painting and priming the crib was actually pretty easy. Giving the wooden crib a makeover to match our vision for Scarlett's owl nursery would have been more difficult to paint using a brush because of so many spindles. We also bought a few extra letters so that we could spell out our baby girl's name since we had some duplicates (a's and e's, mostly). To make the wall hanging, my husband hung some fishing line and I used brightly colored mini-clothespins to hang the letters on the invisible line. The aqua blue paint color of the nursery came from Lowe's home decorating center and the name is Grand Hotel Mackinac Island Blue. As far as any other details - we had a lot of fun putting things together and doing it ourselves and it actually saved us quite a bit of money, too. Etsy was a great resource for finding the alphabet cards and the custom prints that I had framed. 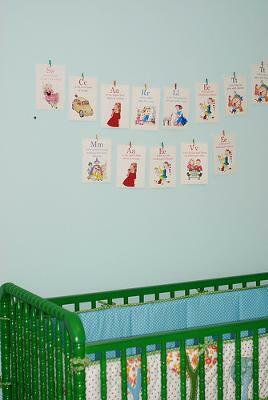 What is your favorite part of your baby girl's nursery? Oh, and my favorite part of the baby's room has to be the "Penguin Classics" that I bought. They are the the fabric covered books that are on top of the wardrobe. They're just really fun and cute! Thanks so much for sharing the pictures of your baby girl's nursery! 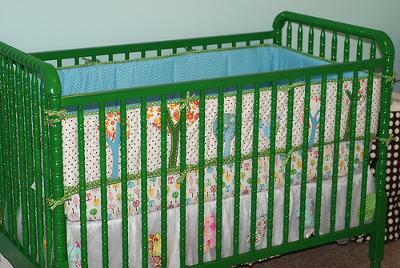 The idea to paint Scarlett's crib green was pure genius. It's the bold decorating decisions like this one that sets a nursery's design apart and makes it unique! 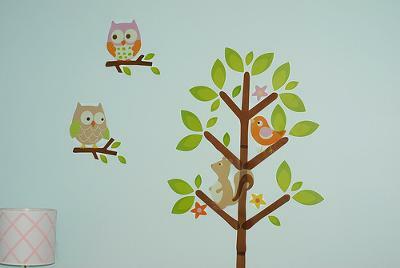 where did you get the wall decals of the owls and tree. i have the same bedding and LoVE it!! Join in and write your own page! It's easy to do. How? 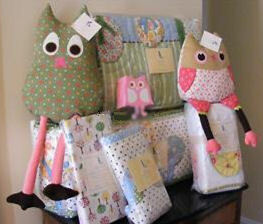 Simply click here to return to OWL BABY NURSERY THEME .